Console gaming is probably the most eminent form of entertainment across the universe as it requires less equipment and workspace. However, most of its gamers still find themselves suffering from chest, neck, shoulder and back pains after spending a couple of hours gaming. Space is an important consideration when it comes to convenience and comfort during gaming. However, the size of your gaming station should also be put into thought. The best console gaming desk should be able to accommodate your PC, gaming console, projector, keyboard, headphones, gaming controllers and mouse among other gaming essentials and leave sufficient space for movement of your hands. If space is not a constraint, then you could get a bigger table that can accommodate multiple display monitors, else you may consider having them mounted on your walls to save on space. While some people may go for the standard rectangular gaming desk, choosing an L-shaped one that will take up one corner of your gaming station, will give you better access to gaming equipment thus offering easier control and multitasking. There are also U-shaped console gaming desks that offer maximum accessibility, but they take up more space as compared to the L-shaped desk. The design of the gaming chair goes way beyond its physical appearance. For instance, you can choose one from a standard, L-shaped or U-shaped console gaming desk depending on your gaming needs. The design should be user-friendly, with a height that enhances proper sitting or standing posture. This is such that the display screen is at the same horizontal level as the gamer’s eyes and the controllers are at the same level as their hands. It helps if the height is adjustable so that it can be customized depending on the size of the user and the type of gaming chair being used. Foldable designs are also becoming common especially for gamers who want to save space or those who work on temporary gaming stations. 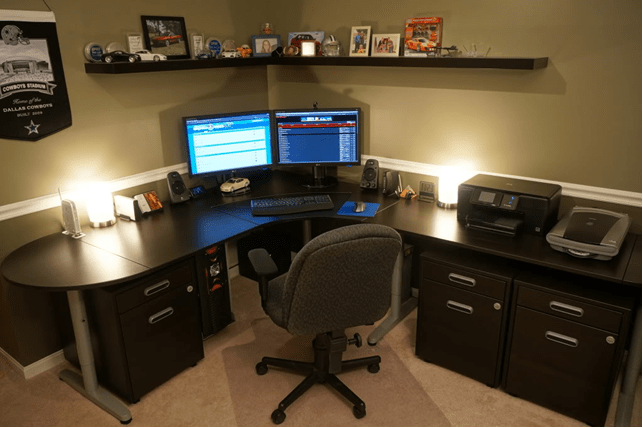 The surface of the desk should be clean, strong and smooth, with most gamers preferring desktops made of stainless steel, hardwood, glass or PVC. When deciding on the design of your gaming table, you should consider ease of use, comfort, ease of maintenance, size and weight. The quality of materials used to make a gaming desk will determine if you will have to resend it back to the seller, or if you’ll spend the next two decades with this same gaming table. Durability is among the most important factors to consider on how to choose the best gaming desk. The most common materials used to make gaming desks include strong stainless steel, PVC, hardwood and glass. Its chassis should be made of solid sturdy materials, preferably stainless steel or hardwood as it will be holding all the weight of your gaming equipment. The materials used should be resistant to scratches, corrosion and other forms of wear and tear that are common within a gaming station. In addition to durability, you also need to consider if there is a warranty that comes with the desk, and how long it lasts. The longer the warranty the better it is for you. Different kinds of games usually require different types of gaming equipment. Since you may not need all of them at all times, it is obvious that you will need to store them until they are needed. A gaming desk should offer enough storage to accommodate all the equipment and stuff you need to store. It should come with enough drawers and compartments for your headphones, mouse, graphic tablets, keyboards, console, gaming controllers, printer, paper and stationery among others. It helps if some of these compartments are detachable for creation of more legroom whenever needed. Cable maintenance is also another essential part of storage. Cable grommets and holders reduce tangling of the numerous cables connecting different gaming equipment and other messes caused by these cables, leaving your gaming station clean and neat. Unlike in the past when gaming tables used to come as a single solid unit, nowadays they are made in such a way that they can be assembled and disassembled by the buyer, making them more portable and easier to store. However, this doesn’t mean that the desk should come in extremely small subdivisions that make assembly difficult. Once it is out of the box, its set up should be easy and fast. Most desks usually come with assembly instructions in its user manual. The easiest gaming tables to assemble usually have just a few attachments, and in case you experience trouble putting them together, your seller should be able to provide contacts of a reliable assembly expert. However, if you want to avoid all this hassle, then you should buy smaller gaming desks that are fully preassembled. Your budget is probably the biggest determinant of the kind of gaming desk you can lay your hands on. Since it is apparent that the higher your budget, the better the gaming table, it helps to have realistic expectations when shopping for it. However, if you are running low on budget, it is important to look at the most essential features that will make you gaming experience better. Most gaming desks cost between $150 and $1000, which is quite affordable in my opinion. Nonetheless, there is no limit as to how much you are willing to spend on your dream gaming table. Just be careful not to spend a fortune on a console gaming desk that may leave you disappointed. Are you jittery about replacing your gaming desk, or buying one for the first time? Actually, you should not worry anymore, because these tips are all you need to be able to get your ideal gaming desk. The toughest part of shopping, which entails researching has been done for you. All you need to do now is head over to the gaming accessories store, compare the available models and choose the one that works best for you. With the above tips, you will have no regrets about adding such a valuable investment to your gaming station.